Who will be the best mayor working for Hoboken? This Tuesday, all the campaigning, mailers and arguments in Hoboken will end. Voters will go to the polls and decide who should be the next Hoboken mayor. This election is by any measure contentious and the flood of outside monies in the hundreds of thousands of dollars, PAC activities and some underhanded actions will cause some to recoil in horror and disgust. Nevertheless, it's a decision that voters will decide who should lead Hoboken for the next four years. Mayor Zimmer's successes are notable but her second term, especially over the last two years shows she lost her desire to listen or work with others. She's been pushing for her third term via her council whip, Councilman Ravi Bhalla. It's her last and final partisan action as Washington St. sits resembling more a Third World thoroughfare and a debt approaching $10 million owed to Suez Water remains less than fully explained. A third Zimmer term in any guise is ill-advised. 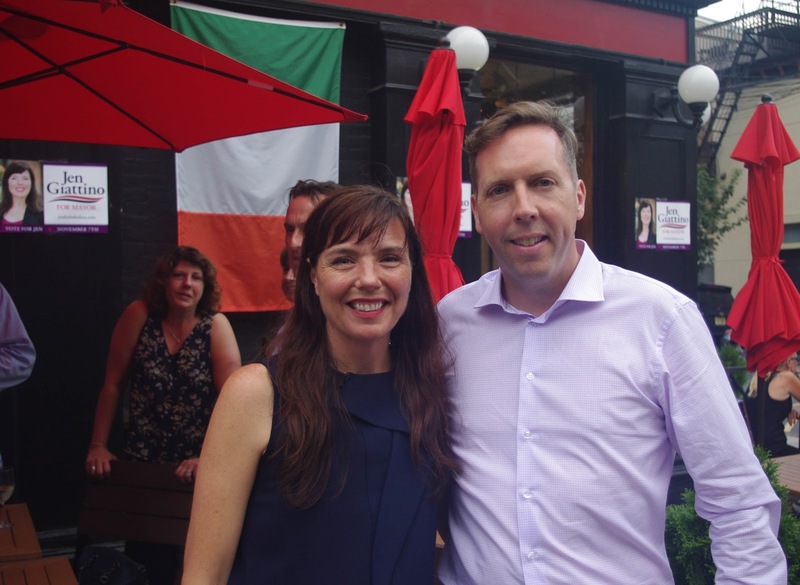 Jen Giattino with a local supporter last summer at her kickoff campaign event. on Tuesday for Hoboken mayor. So who is best situated and experienced to lead Hoboken? Someone who is not only willing but eager to listen to others before pushing forward with a decision? There's but one choice: Jen Giattino. City Council President Jen Giattino has served honorably on and off the City Council for more than six years. Prior to her involvement in elected office she volunteered as a citizen at the Hoboken Homeless Shelter and supporting good governance reforms at City Hall and the district schools. She's applied a business-like approach to City Council meetings earning the trust of her colleagues and been elected 50% of her time there as its council president. When Giattino arrived as the sixth ward councilwoman on July 1st, 2011, Hoboken politics was a mess. Fractured ugly partisanship reigned with petty power squabbles and attempts to do the City in and an effort to stop any progress financially harming Hoboken by forcing the local hospital to close. It was so bad Hudson County officials who consider themselves hardened politicos winced. Jen Giattino's arrival would change all of it. Her steady leadership throughout faced down numerous challenges big and small. Her decisive votes on the City Council aided passage for many important changes keeping Hoboken spending down and taxes flat, saving the hospital and obtaining the largest parcel of land, almost six acres at the Henkel site on the upper west side of Hoboken to name a few. These however are only some of the most visible accomplishments. Most important is Jen Giattino's character where she's respected and trusted by both friend and foe alike. Having watched her growth on the council over six plus years, she's exercised restraint in seeking to find consensus with others. This was a quality Mayor Zimmer attempted early on but in recent years opted not to follow. Recent Team Giattino photos on Facebook show volunteers out and about engaging with Hoboken voters. One of those volunteers is former Hoboken councilman Tim Occhipinti. He was part of the opposition when he served on the council in 2010 and nothing speaks more to earned respect than winning over the hearts and minds of those who didn't always agree with you. It also speaks highly of the respect, esteem and trust earned by Jen Giattino. Hoboken in the end is a municipality of 55,000 and a small mile square in Hudson County. It's regained some dignity in recent years but likely loses it should an alternative to Giattino take office. This is no small matter with the revelation of more than $50,000 spent by a PAC backing Ravi Bhalla and hundreds of thousands pouring in for him and others from outside Hoboken. Recent analysis of the campaign funds of the top four candidates shows only Jen Giattino running with close to 90% of her campaign funding coming from Hoboken residents. She's beholden to no one outside the Mile Square City, any special interest group or big developer PAC. This is not an inconsequential matter and will be decisive on Tuesday when voters head to the polls. While Ravi Bhalla has a strong eight years on the council, he's tried to escape local office in 2011 for NJ Assembly after only two years and made another similar attempt in 2013 for that office before bowing out. His heart is not in local elective office but he may turn into a good regional legislator. Longstanding concerns about Bhalla trading on Hoboken are real, demonstrable and problematic: witness the PAC spending over $50,000 to see Ravi Bhalla elected mayor. These outside special interests are threatening with Hoboken coming to finality on the proposed massive redevelopment plan by NJ Transit downtown. Hoboken will be facing citywide major decisions on development in the next four years and getting it right is a focus Jen Giattino made a central plank of her mayoral run. Councilman Bhalla showed why so many whispered concerns prior and the Stronger Together PAC is not showering tens of thousands on him as part of any Festivus miracle. The other major choices fare little better in comparison to Jen Giattino. Councilman Mike DeFusco has shown a lack of reliability on his word demonstrating a blind ambition problematic with the most scant review. He's surrounded himself with Old Guard politicos who many feel should not be allowed any hand on the wheel at City Hall. Freeholder Anthony Romano has a long political career but it's not demonstrated any result of note outside of massive county tax increases and he's not backed Reform in Hoboken at any point in time. Residents know that means more of the same. Jen Giattino has a vision for Hoboken inclusive of all residents. Hoboken voters should take time to learn the facts today and the history of yesteryear as this will be a major decision for the Mile Square City's future. You can read more about Team Giattino and learn why Jen Giattino seeks your vote and support for her council at-large slate of Jim Aibel, Jason Ellis and Sal Starace. On Tuesday, voters should strongly consider track records and histories inside and outside of local government and choose Jen Giattino to be Hoboken's next mayor. She's demonstrated through action why she'll be the best mayor working for all Hoboken.